Europe is showing its true, ugly-very ugly self....!! Observing the recent developments in Europe, one can not but feel utter shame and disgust. The refugee crisis that has been troubling our continent for the past year, has finally managed to bring the EU on the verge of disintegration. The Schengen Agreement, that offers us citizens one of the greatest benefits from our country's EU membership, is under threat. In most countries, the Far-Right is gaining support, fences are being put in place, anti-immigrant protests and sentiments are on the rise, while our governments are still debating how to respond. European nations haven't managed to coordinate their efforts in dealing with this challenge. While some, like Sweden and Germany, have done more than their fair share, others preferred to do the minimum possible. Most Eastern European states, have turned even anti-European and decided to vote in governments that are openly Euro-skeptic, anti-immigrant and conservative. Empowering of course the British skeptics, which since the very beginning of this humanitarian crisis, found just another reason to turn their backs to the rest of Europe. They have now added the immigration crisis into their list of reasons to leave the EU. Poland, together with Hungary now form a rising Euro-skeptic block in the Eastern Europe, promoting, nationalism and populism, where there once was optimism and hope for the European project. Naturally bringing these two countries in coalition with Germany, who seems to be increasingly the only nation still supporting European integration. Others like Slovakia and Cyprus, have openly stated that they would only accept Christian refugees, while the Baltic states have also turned sour on the idea of accepting Muslims. In this absolute ugly mess, Greece's EU partners shamelessly have often called for the country to be kicked out of the Schengen Agreement, because apparently "it can not guard its own borders!" This is plain scapegoating, just as they did with the euro crisis. Instead of admitting that the euro-zone was very badly designed, they blamed all its failures on its weakest link. Now they are placing Greece again on the defendant seat, blaming it for the worsening refugee crisis. It is a disgraceful claim, as Greece once again is being unfairly treated by its so called "partners". First of all Greece has mainly sea borders with its neighbor-Turkey, which the Europeans decided to give 3 billion euro in order to bribe them and make them help Europe with the problem. To no avail of course. It is very difficult to guard such extended shorelines against such volumes of people arriving; no nation was ever prepared for such thing. But a continent with some of the most prosperous nations of this world, should have been. It is Europe collectively that should have already coped on and created a unified force to deal with the problem; either a common European army or an empowered FRONTEX, in which all EU countries would contribute and be part of. Greece is not the desired destination for the refugees, the rich states of the North are. Thus making this problem a European one, not just a Greek or Turkish one. There are simply no words to describe the above statement. It is at least vile and outrageous. If Greece ever openly proceeded in such practices, I am sure that countries like Belgium would be the first to throw stones at it for being undemocratic, breaking humanitarian laws, non fitting for the European family etc. But behind the scenes, the rich European states are unveiling their true selfish, arrogant and fascist face. If they really cared about solving the refugee crisis, they would have acted years ago. This problem has been accumulating, confined in the borders of Jordan, Turkey and Iraq for years now. Why hasn't Europe, too absorbed by sorting out its own finances, foreseen the potential disaster and done something about it? Assist the Middle Eastern countries and help the refugees to stay in the region. Offer them humanitarian assistance and use diplomacy, to convince other rich nations of the world to contribute in this effort. Now that the crisis has reach a breaking point, they are seeking someone to take the blame and be ridiculed. And so it is Greece again who must answer for the mess, while the finger must be pointed to the rich Western European countries and their arms industries who have been supplying weapons to the region, fueling this disastrous conflict, while they are making profit out of it. In addition, Europe's governments and media must answer for their support of US foreign policy in the region, supporting the Syrian rebels and fanning the conflict in order to destabilize the region. Once you meddle with other countries' internal affairs, who must be able to accept the consequences. Most EU governments have been supporting America and its policies in Syria. Also we must not forget that Europe has been where Syria is now in the past, after WW2. Especially the Eastern European countries, which have seen waves of refugees escaping to the Western part of the continent over the past decades, one would expect them now to be very supportive towards the Syrians. It was not long ago, that the stereotype of the "Polish plumber" stealing jobs from Western Europeans, was also shaming our continent. Europe has become an ugly place to live and I am increasingly disgusted with where the continent and the EU are heading. My view of Europe is an open society with open internal borders, a beacon of humanity and prosperity that's true to its values that it so much prides itself of. There is so little of this on display nowadays and as Europeans are increasingly turning more xenophobic and nationalist, I hold little hope for a future united Europe, that will be a happy place to live in. Indeed to declare on a piece of paper egalitarianism and solidarity in order to form a more perfect union and then violate those principles in practice, ultimately means that the union will disintegrate or a civil war will ensue, to wit the United States of America. Those who do not learn from history are bound to repeat its worst mistakes. Multiculturalism and religious pluralism has never worked out well for Europe. I would not imagine Germany, Austria, or even Italy becoming eager to welcome these refugees. In such bad economic situation, where jobs are scarce, could Europe really afford to accommodate refugees? You write that "European states are unveiling their true selfish, arrogant and fascist face. 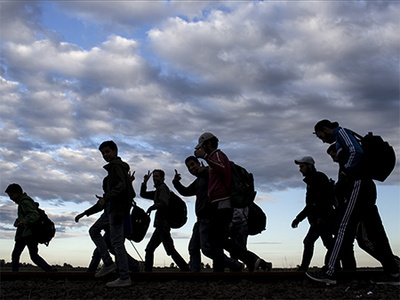 If they really cared about solving the refugee crisis, they would have acted years ago." I am sorry Mr. Mouzeviris but Europe has its fair share of concerns other than the refugee crisis and cannot act like Santa Clause, giving generous hand-outs to refugees. And stop using the word "fascist" so loosely. It is NOT FASCIST to protect YOUR NATION, YOUR HERITAGE, YOUR HISTORY AS PEOPLE. I am sure the founding fathers of your nation would have been infuriated with your open policy "anything goes" views. The truth of the matter is that EUROPE DOES NOT OWE THESE REFUGEES ANYTHING. Not one thing. Start having pride in yourself and your culture and you will NOT HAVE THE SAME 'NICE, NICE' VIEWS AS YOU DO. Honestly, this is what I always loved most about Europe: The tough, no-nonsense leadership that is able to keep immigrants out of Europe to preserve the continent's history and heritage! Europe always took pride of Democracy, human rights, tolerance, freedom and now you ask Europeans to "protect YOUR NATION, YOUR HERITAGE, YOUR HISTORY AS PEOPLE"? Words of tolerance? "EUROPE DOES NOT OWE THESE REFUGEES ANYTHING" I sincerely hope you are not European and you are part of some kind of Tramp-basket. Alan, there should be NO tolerance for vultures who want to take advantage of what was created and developed in Europe. Europe really fought hard for truth-it does not need these vultures to take advantage of what was established after all it has been through. You really don't understand yourself as a European if you allow an open-door policy regarding immigration. You don't love your history, your continent, your nation? People like you are to blame for fake multiculturalism, fake religious pluralism, and the general mess European society is in!